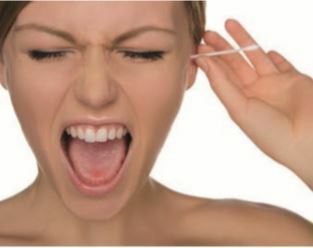 In my years of being a Hearing Audiologist I have been told many stories about what people clean their ears with from the everyday cotton swabs to pens, paperclips, hair grips, glasses arms, car keys. I’m sure nearly everyone reading this is guilty of sticking something in their ears they are not supposed to so I’m going to explain why the old wives tale ‘nothing smaller than your elbow’ is so true. Our ears are designed by nature to be both self-cleaning and self-protecting and that’s why by using the wrong cleaning methods, you risk causing injury to the ears, damaging your hearing or even causing infections. getting dry and itchy. In addition, earwax traps dust and germs, keeping them from reaching the eardrum. Usually, you don’t need to do anything to help this natural cleaning process unless you suﬀer from an impaction that may have to be removed. Trying to forcibly remove the ear’s protective wax layer or stop an itch can damage the delicate skin of the ear canal or puncture (put a hole in) the eardrum. This can increase your risk of infection and lead to a permanent hearing loss needing either surgery or a hearing aid to correct the impairment. So it is best to leave the inside of your ear alone and not disturb its natural environment. This means no cotton swabs, no ﬁngers and certainly no sharp objects, keep your hair grips for holding your hair back and keep your car keys for unlocking your car! The ear canal is narrow and curved, consequently some people are susceptible to getting blockages of wax, skin, foreign objects, debris from infection. If a blockage is present you may notice your hearing seems, dull, there may be a ringing sound in your ears, your ears may feel full become itchy or ache. If this is the case you will need to have it professionally removed. Although there are several methods to clean your ears such as syringing, sprays and drops, Microsuction is renowned as the most eﬃcient and the safest. It is highly recommended by GP’s, audiologists and ENT consultants. Microsuction of an ear canal is performed under direct vision using a microscope. The ear canal is cleared using gentle suction, proving to be the most eﬀective way to clean the ears reducing all risks of infection.